Abstract: A new research report (2018 -PDF in Greek) by diaNEOsis addresses three of the most important factors that -like mythical dragons- keep growth, employment and prosperity captive. These include the enormous public debt, the faltering social security system and the dysfunctional tax system. Analyzing the roots and the interconnections of the three issues, the report comes up with a solid proposal to tackle them all through more investment, lower insurance contributions and a simplified tax system respectively. Such a policy shift requires a major reprofiling of official debt repayments and a renegotiation between Greece and the official creditors on the fiscal surpluses after the expiration of the current program in August 2018. In the aftermath of the 2008 global crisis, public debt in Greece entered a path of explosive growth, far steeper than the rise experienced in other developed economies as a result of swollen fiscal deficits. International markets quickly branded Greek debt as unsustainable, though a country default was technically avoided by letting the European Commission (EC), the European Central Bank (ECB) and the International Monetary Fund (IMF) to step in and finance debt repayments in exchange for a harsh adjustment program. The bailout agreement (the so-called “Memorandum”) aimed at restoring public finances, promoting reforms and stabilizing the debt to output ratio, at that time peaking at the onerous 127% of GDP. However, and contrary to the official expectations, public debt continued to rise, while the economy was experiencing a deep and unprecedented recession. Hence, a new program, approved in 2012, included a nominal reduction of public debt to the tune of €110 billion and a second round of fiscal measures. Once more, economic activity plummeted and, with unemployment soaring at 29% of the workforce, social tensions intensified. Eventually, the negotiations with creditors turned sour and in 2015 Greece risked an exit from the European common currency, before an even harsher battery of austerity was finally imposed as a third program that is due to expire in August 2018. Despite repeated designs and wishful thinking, Greek public debt continues to be at high levels relative to the country’s GDP. In 2017 it ended up at 179% of GDP, a huge deterioration relative to the 127% level that precipitated the crisis in Greece and engulfed the Euro area. 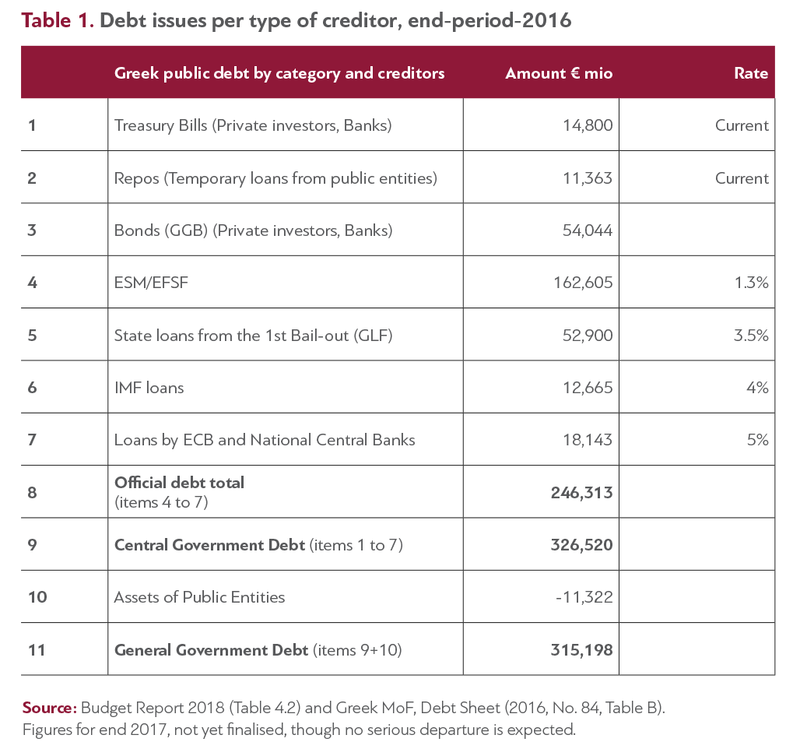 Table 1 shows the current composition of Greek public debt, totaling €315 billion. The unusual characteristic here is that the majority (78%) of debt is held by the official sector (ESM, GLF, IMF and the ECB), while only 7% is in the hands of foreign private investors. It is evident that controlling Greek public debt heavily depends on the future arrangements between Greece and its creditors, and thus far this seems to be insufficiently arranged. Although the details of the post-program relations are not yet finalized, there is a basic agreement on the fiscal stance that Greece has to adopt for achieving particularly high primary surpluses of 3.5% of GDP for 2018-2022, 2.50% until 2029 and 2% thereafter; see Table 2. In case debt amortizations fail to be honoured on schedule, the understanding is that repayments and interest payments will be eased down by reprofiling of short and medium term maturities to the longer run. 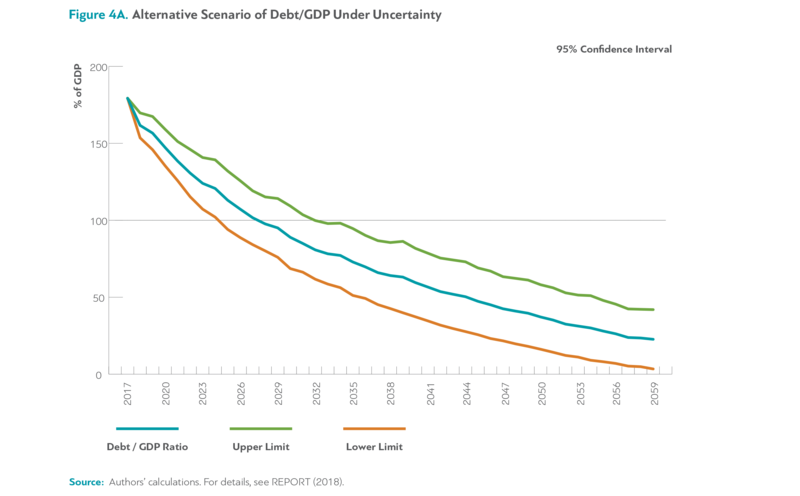 The official Debt Sustainability Scenario (DSA) predicts that -under the assumptions of the baseline scenario in Table 2- debt will fall below 100% of GDP in mid 2020s, while Gross Financial Needs (GFN) will remain below the critical ceiling of 20% of GDP. However, achieving such high primary surpluses for a long period would be difficult for Greece because –in the aftermath of a deep recession– they will put further pressure on growth and employment and may lead to additional social tensions. As 85% of debt is held abroad either officially or privately, the use of high primary surpluses for debt servicing implies that substantial sums are channeled-out of the country, thus deteriorating the liquidity problem and further suppressing activity in the domestic economy. Moreover, the privatization targets of €17 billion within the next ten years are not easily realized in an environment of economic stagnation and social unrest. Therefore, the sustainability indices –in terms of debt to GDP ratio or GFNs to GDP ratio– may differ significantly from the DSA projections. The present study questions the realism of the official assumptions under uncertainty, by performing Monte-Carlo simulations with shocks on the inflation rate, the growth rate and the fiscal target. The key mechanism that renders the optimistic predictions on sustainability insufficient for ensuring debt sustainability is that the anaemic growth rate that prevails in the medium and longer run is unable to lift GDP enough to compensate for the rise in interest payments in case those adverse shocks impinge upon the economy. 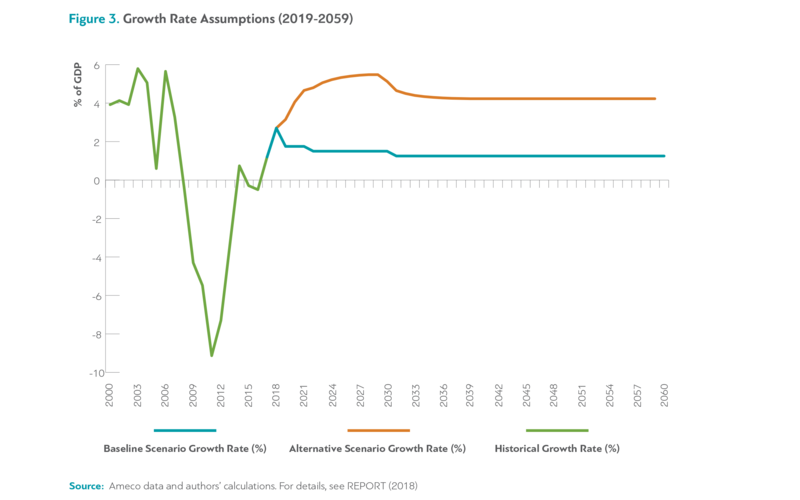 An alternative proposal is shown in Table 2, suggesting a new policy mix with the primary surplus lowered down to 1.5% of GDP, while the additional 2% of GDP finances investment and export-led growth. 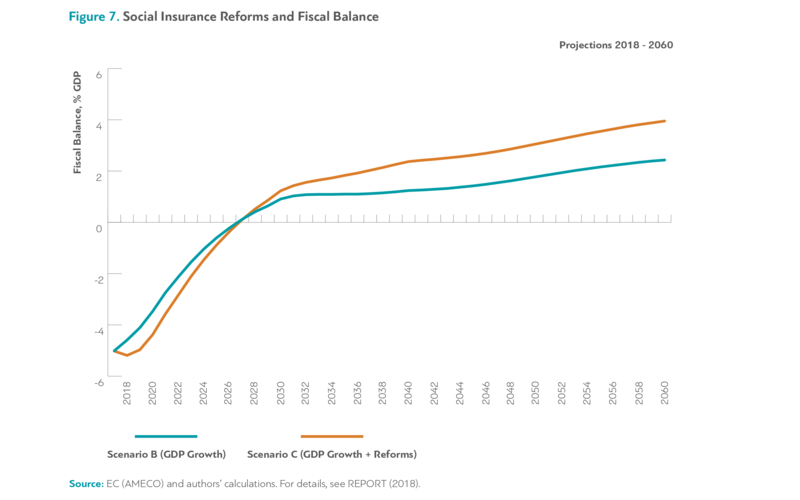 This ensures a better balancing between fiscal stability and economic growth, thus generating more sustainable projections of public debt in the medium and long-term. Moreover, a set of reforms in the tax structure and the social insurance system can further promote employment and efficiency in the Greek economy. 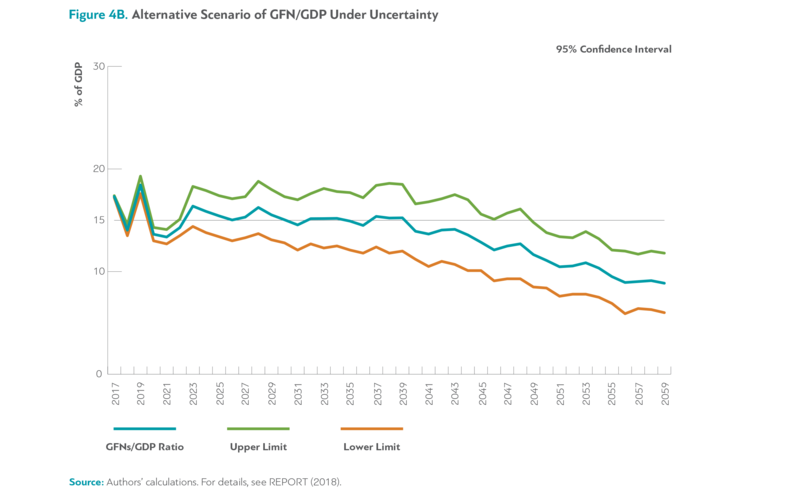 In order to assess the full impact of uncertainty, we employ Monte Carlo simulations in a dynamic model and construct 95% confidence intervals for the debt to GDP ratio and the GFNs to GDP ratio. 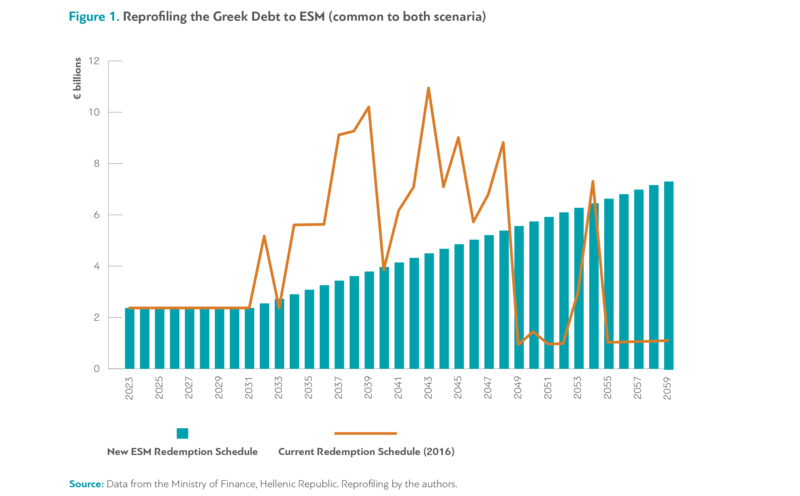 In order to improve the debt to GDP outlook, we first assume that an extensive reprofiling of future repayments to the ESM takes place as shown in Figure 1. In the proposed scheme, all repayment peaks in the next two decades are scaled-down and the bulk of obligations are rescheduled for afterwards. The simulation results show that the mean level of debt to GDP ratio falls below 100% of GDP only in the mid-2030s, while the mean level of GFNs to GDP remains between 15%-20% for a long period; see Figure 2A and 2B respectively. Thus, the Greek public debt is only marginally sustainable, even in the absence of shocks. 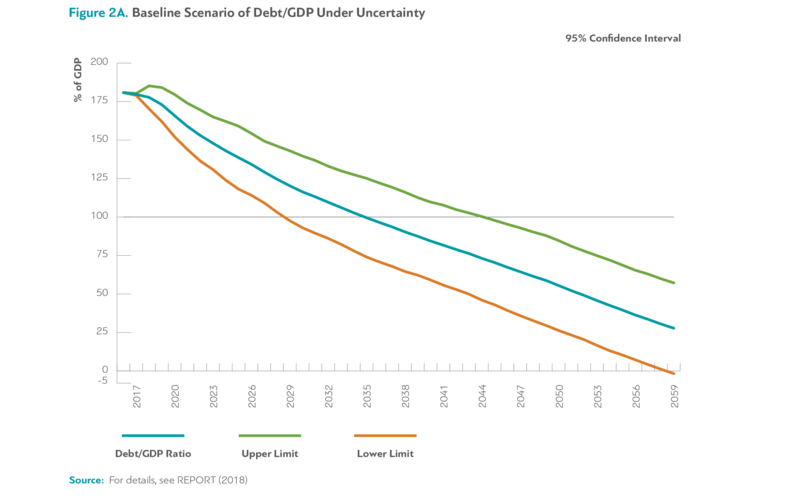 However, the band limits indicate that under uncertainty the risk of the debt to GDP ratio staying in excess of 100% until mid-2040s is not unlikely at the 95% level. The same finding applies for the probability of GFNs staying above 25% of GDP for a long period, thus grossly violating sustainability levels. Incorporated in the risk-pricing analysis of sovereign debt investors, this result implies that borrowing costs may stay at such high levels that prohibit the effective management of the Greek debt after the expiration of the program in 2018. In the alternative scenario, the mechanism that leads to higher growth rates is the public investment multiplier. We assume that a one-off (i.e. only for one year) increase in public investment by one percentage unit of GDP raises GDP by 1.2 during the first year and peters out in about five years. The positive impact on growth of the additional public investment based on the multiplier effect for the period 2019-2059 is depicted in Figure 3. We also assume that the increased growth rates accelerate privatizations and raise more revenues to be used for debt buybacks. 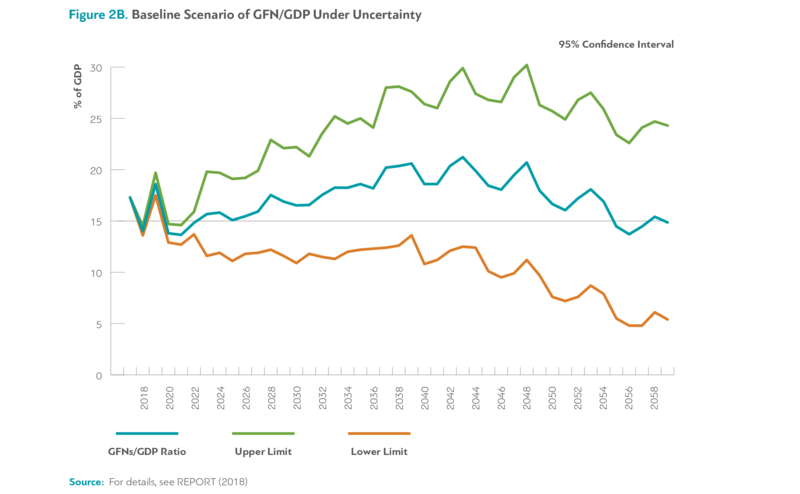 The results of the growth-oriented scenario suggest that the General Government debt now falls below 100% of GDP in 2029 (Figure 4A), while GFNs are below or around 15% of GDP –with an extremely low probability (less than 5%) to exceed 20% of GDP; see Figure 4B. Achieving sustainability of public debt is only a necessary – though by no means sufficient - condition for Greece to exit the current state of economic malaise and start rebuilding the economy toward more employment and efficiency. A number of reforms in social security and the tax system are suggested in order to remove major inefficiencies inherent in the labor market and the revenue collection process in Greece. Thus far, the fiscal adjustment effort –especially during the third program– was characterized by strong increases in both the tax rates and social insurance contributions in order to enhance public revenues. The fiscal targets were finally met, but at the expense of creating new distortions and inefficiencies in the labor market and the tax system. For example, social insurance rates went up beyond their Euro area counterparts, but revenues as a share of GDP continued to lag behind the other member-states. This happens because the incentives for moonlight employment became stronger, thus registered employment decreased, indicating the existence of Laffer-curve effects. The reform in the social insurance regime relies on (a) the reduction of social insurance contributions rates, and (b) the introduction of private financial management of supplementary pensions. The prime social insurance cut amounts to the complete annulment of the employees’ contribution rate (currently at 6.67%) and the reduction of the employer’s rate by 1.33 percentage units. This leads to a total reduction of contributions by eight percentage units from 20% to 12% of the nominal wage rate, thus reinforcing employees’ disposable income. 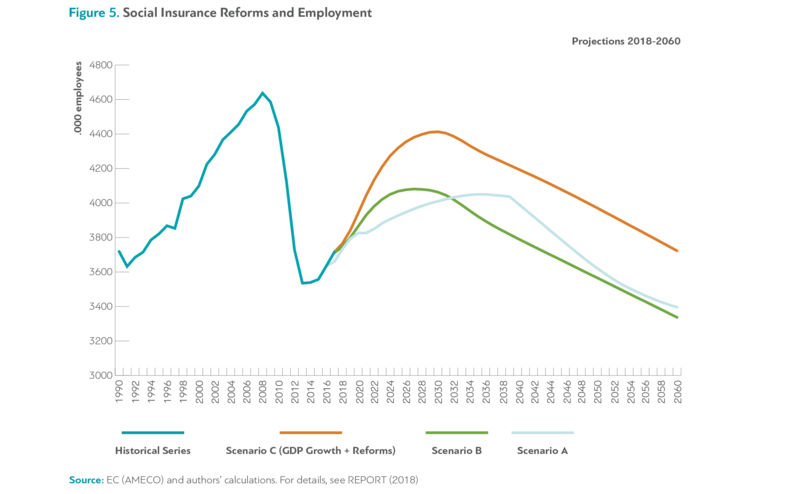 The study examines three alternative scenarios: scenario A reflects the current pension system running along the baseline growth rate; scenario B evolves along the higher growth rates as in Section 2 but without further reforms; scenario C includes higher growth rates and the new mix of social insurance rates. 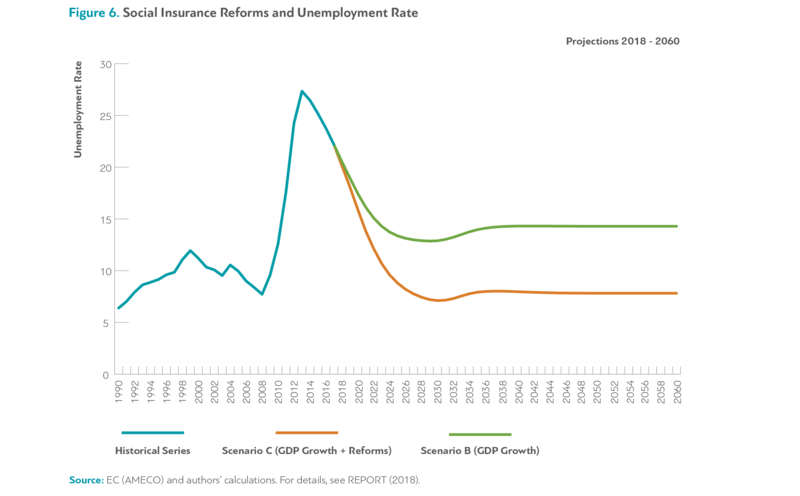 The results suggest that the reduction of social insurance contributions’ rate will gradually increase employment by 405,000 new jobs; see Figure 5. Unemployment rate falls to 7% during the first decade of reforms, in contrast with the no-reform scenario where unemployment rate remains around 14% (Figure 6). Concerning the fiscal consequences of the reform, public funding of the pension system will remain crucial during 2020-2045, but on average will not exceed the provisions of the current scenario (A), as the increase in employment compensates for the loss of revenues due to lower rates; see Figure 7. 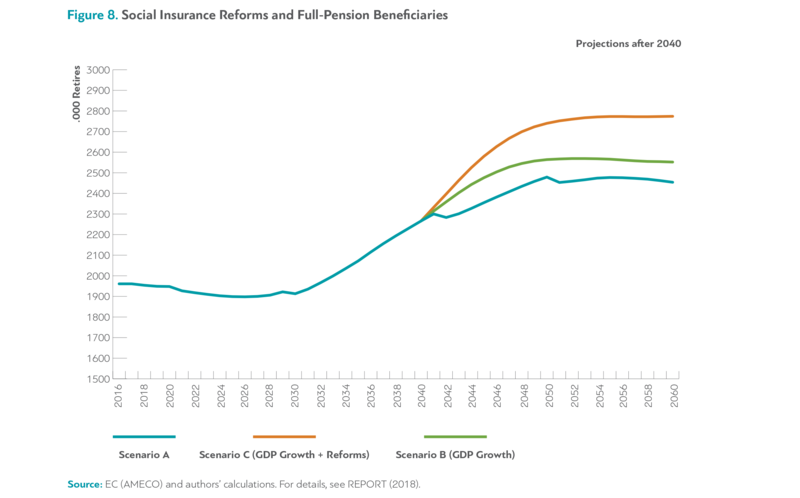 Furthermore, future full-pension beneficiaries increase and enjoy higher benefits, thanks to the higher returns of the privately managed supplementary pension fund (Figure 8). Therefore, a reduction of contribution rates gradually leads to an increase in total incomes for both employees and pensioners. Regarding the tax system, public revenues as a percentage of GDP have at last converged to the Euro area average, though some crucial asymmetries are still looming. These include: (i) indirect taxes are significantly higher than the Euro area average, (ii) direct taxes are significantly lower than the Euro area average, (iii) there are too many rates and even more tax breaks causing complications and high costs, and, (iv) tax collection is not efficient causing large revenue gaps, especially regarding the VAT. These findings imply that there is room for reform in both direct and indirect tax systems. all other income generated from different sources (such as interest, dividends, house rents, etc.) is taxed by 20%. Second, the proposal on indirect taxation suggests the introduction of only two VAT rates with a standard rate of 20% and a reduced rate of 10%, while the current mid-rate of 13% is abolished. Changes in tax rates are accompanied by structural reforms in tax administration in order to enhance efficiency and transparency. 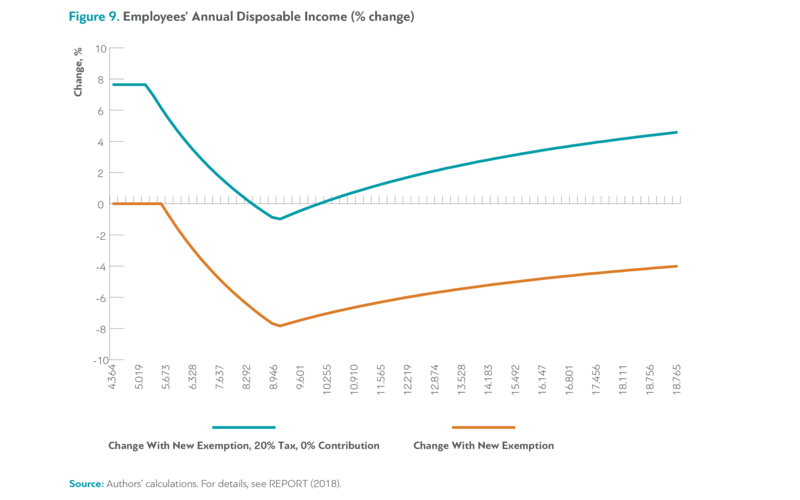 As shown in Figure 9, the new combination of tax rates and social contributions rates allows employees to recover losses caused by the reduction of tax-free threshold, and their disposable incomes rise modestly. On the other hand, the abolishment of employees’ primary contributions undercuts the incentives for informal employment and raises the participation rate and taxable incomes. The study concludes that a new policy mix with lower primary surpluses, higher public investment, and a set of tax and pension system reforms ensures that GFNs remain safely below 20% of GDP, while higher growth rates lead the debt to GDP ratio below 100% within a decade. At the same time, the alternative policy set enhances infrastructure investment and improves competitiveness, thus boosting exports. This ration helps the current account deficit from being led towards a new deterioration as the demand for imports lifts up due to higher growth.